We want to offer our thanks and gratitude to all our loyal friends, fans and family. This holiday feast season we offer an excerpt from our Farm to Table calendar by Ann Lovejoy. As well as a family heirloom from our Art director, Lydia Hess — her grandmother’s Corn Bread Dressing Recipe. Most farmers markets sell local eggs, milk, cheeses, fruits, vegetables and baked goods. Some even offer fresh fish from local fishermen, locally raised poultry and regional wines. For the holidays, compose a celebratory meal of local specialties, from kale and apple salad and roasted root vegetable soup to bakery bread and pies. In a large pan, melt butter and add onion and salt. Saute over medium-high heat for 5 minutes. Add apples, walnuts and rosemary and cook for 5 minutes. Stir in bread and moisten with wine as needed, starting with ½ cup[JC1] . Mixture should be moist, not soggy. Stuff bird loosely and bake at 325°F until meat thermometer reads 165°F [JC2] (about 20 minutes per pound), basting with pan juices 4-5 times during cooking. Lightly sauté the veggie trinity about 3 minutes. You want them to be crunchy. Tear up the white bread and break up the cornbread into 1″ to 2″ pieces. Transfer the breads into a large bowl. Add the veggies, sage, about a teaspoon of salt and a half teaspoon of black pepper. This is the fun part (my daughters look forward to this every year). Wash your hands and take off your jewelry. Start with adding 3 cups of broth to the bread and veggies. Dive in with both hands and mix it up, squishing the bread, broth and veggies together. Add more broth as needed. NOT TOO MUCH, texture should be slightly moist, yet not too wet. Taste the mixture, you might want to add a bit more sage at this stage. Transfer mixture into an iron skillet or a lightly greased baking dish. Do not smooth out the top, it should look like mountains and valleys. This will allow for some browning of the bread in the baking process. Bake in a 375* over for 45 minutes to 1 hour. Serve with your Thanksgiving turkey and drizzle with giblet gravy. Award-winning author Ann Lovejoy is one of the country’s leading experts on sustainable garden design and techniques. A popular cooking and gardening columnist for numerous national and regional publications, Lovejoy is fully committed to sustainable agriculture and is active in many community projects. 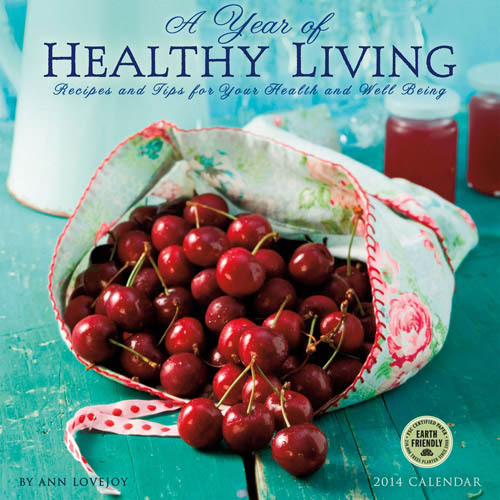 These are some other wonderful calendars authored by Ann Lovejoy from Amber Lotus Publishing. 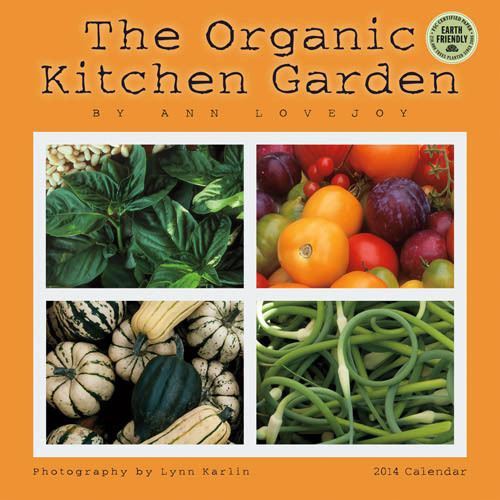 This entry was posted in Artist Spotlight, Holiday Lore, Kitchen & Gardening, Recipes, Urban Farming and tagged Ann Lovejoy, farm to table, Healthy Living, Lydia Hess, Orgainic, Slow Food, Thanksgiving, wall calendar on November 21, 2013 by Amber Lotus Publishing.